Counters matter. Not only do you immediately see them every time you walk into your kitchen and bathroom but you also use them for preparing food, holding your cosmetics, and similar tasks. Make your countertops the best they can be with Callier & Thompson. No matter what style or vibe you're interested in, we can find the best countertops for your bathroom and kitchen. When you remodel your home, you'll have to make many decisions-you'll choose sinks, cabinets, floors, paint colors, and appliances. Don't forget about your countertops. You can make an informed decision with the help of Callier & Thompson. We stock a variety of countertop materials from trusted suppliers. You can view the brands we work with below-just click on an icon to visit the company's website. Our vast countertop inventory includes granite, quartz, laminate, marble, butcher block, glass, and soapstone. We're confident we can help you find the best countertop for your style and your budget. If you'd like to see examples of our past work, visit our kitchen portfolio and our bathroom portfolio. You can see firsthand the quality work we do for our clients, and you can expect the same excellence when we work for you. 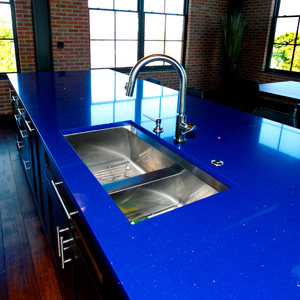 If you need new countertops in the St. Louis, MO, area, Callier & Thompson is ready to help you. All you have to do is call us at 636.391.9099 or fill out our contact form. We'll answer your questions, help you choose the right countertop for your home, and set an appointment to get the countertop installed. If you're not sure what you'd like or if you'd like to speak with us in-person, visit our showroom in Ballwin, MO. We look forward to meeting with you either at our location or in your home.